The German factory orders data could not support EUR. China-US trade war is also putting USD under pressure. 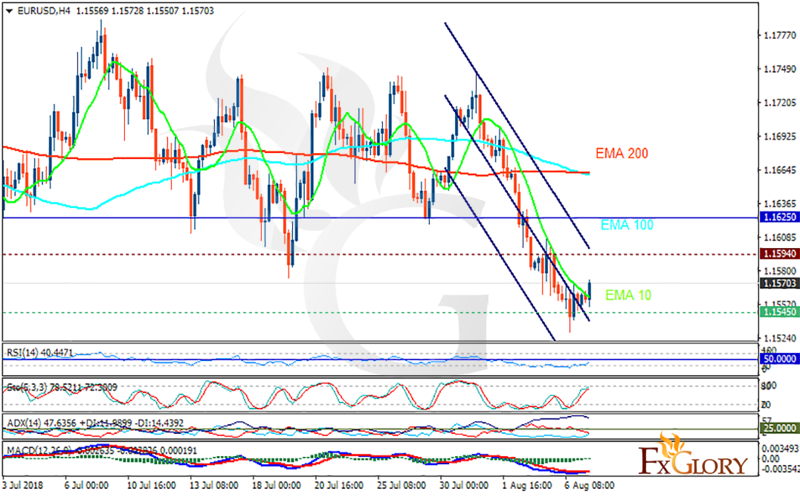 The support rests at 1.15450 with resistance at 1.15940 which both lines are below the weekly pivot point at 1.16250. The EMA of 10 is moving with bearish bias in the descendant channel and it is below the EMA of 100 and the EMA of 200. The RSI is rising towards the 50 level, the Stochastic is showing upward momentum and the MACD line is above the signal line in the positive territory. The ADX is not showing any clear signals. It seems that EURUSD remains bearish however if the resistance level is broken, the correction pattern will start pushing the price up towards 1.16.